Closed Loop 3D Printing is an introductory workshop into the exciting new field of recycled 3D printing. The workshop will begin with a brief visual presentation which will introduce types of 3D printing, materials participants can recycle, and the equipment being used in the workshop. Disposable cups will be collected, washed, dried and shredded to make shrapnel similar to plastic pellets. 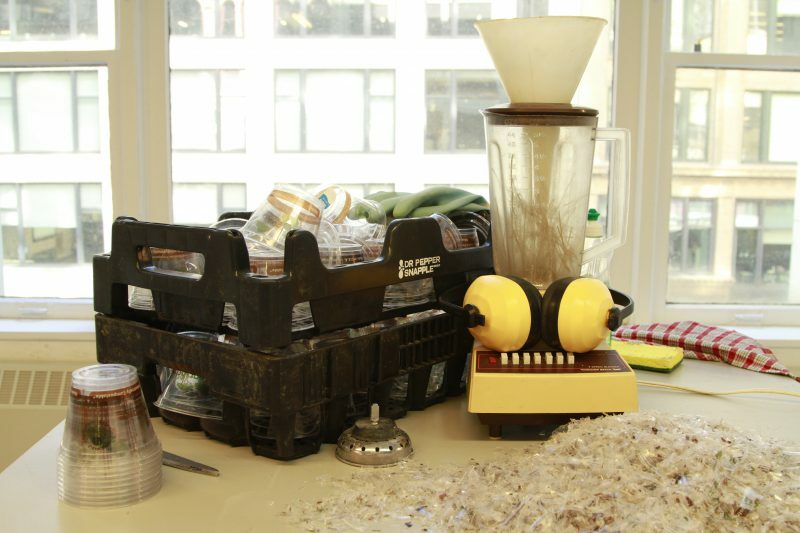 Using this shredded material, participants will extrude their own filament and experiment with some basic 3D printing. The process will form a closed loop, in which the participants can see material transform from disposable waste to a print of their own making. Failed prints, rafts, and other 3D printing waste can also be reprocessed into usable filament. Resource Centre, EV 11-715 @ 1515 Sainte-Catherine W.
This workshop is suitable for makers ranging from beginner to expert level. Space is limited. For more information or questions, please contact Marc Beaulieu (marc.beaulieu@concordia.ca) directly. Keeley Haftner (b. 1985) is a process-driven artist who transforms garbage into sculpture in an attempt to locate its lost material and affective value. She obtained her Bachelor of Fine Arts degree in 2011 from Mount Allison University (MTA) with a triple major in Sculpture, Printmaking and Painting, and completed her Master of Fine Arts degree in 2016 at the School of the Art Institute of Chicago (SAIC) in Fiber and Material Studies. She has exhibited work nationally and internationally, presented and exhibited in numerous conferences and festivals, and participated in residencies within Canada, the U.S, and Iceland.